Alaska's fish habitat protection statutes were adopted shortly after statehood and reflect the longstanding Alaskan ideal that fishery resources and habitats are important for our quality of life and merit protection from unnecessary human disturbance. ADF&G has the statutory responsibility for protecting freshwater anadromous fish habitat and providing free passage for all fish in fresh water bodies (AS 16.05.841-871). Most activities in waterbodies that support anadromous fish will require a Fish Habitat Permit. 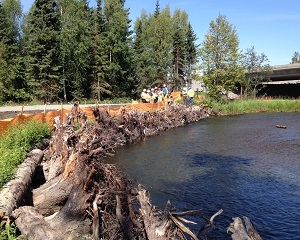 If your project involves water withdrawal or an activity that may have an impact on fish passage (culvert installation, temporary diversion, etc.) and the waterbody supports any species of fish you will likely need to obtain a Fish Habitat Permit. You can find out more about fish resources in your project area by consulting the Fish Resource Monitor or contacting your local Division of Habitat office. any other activity that may affect fish or fish habitat.